University of Michigan scientists have successfully created an aluminum-doped silver film that could replace conventional ITO touchscreens. Indium tin oxide, the main component in most touchscreens, may have a new competitor. Thanks to the work of researchers at the University of Michigan, aluminum-doped silver could be the ideal candidate for ITO succession. Tin-doped indium oxide is a conductive blend of indium, oxygen, and tin primarily used to coat touchscreen and flat displays of smartphones, tablets and TVs. Due to its transparency and excellent electrical conductive properties, ITO has been used in screen anodes for decades. However, it is brittle and lacks flexibility. For these reasons, researchers have been looking for ITO alternatives, including the silver film we’ll discuss. 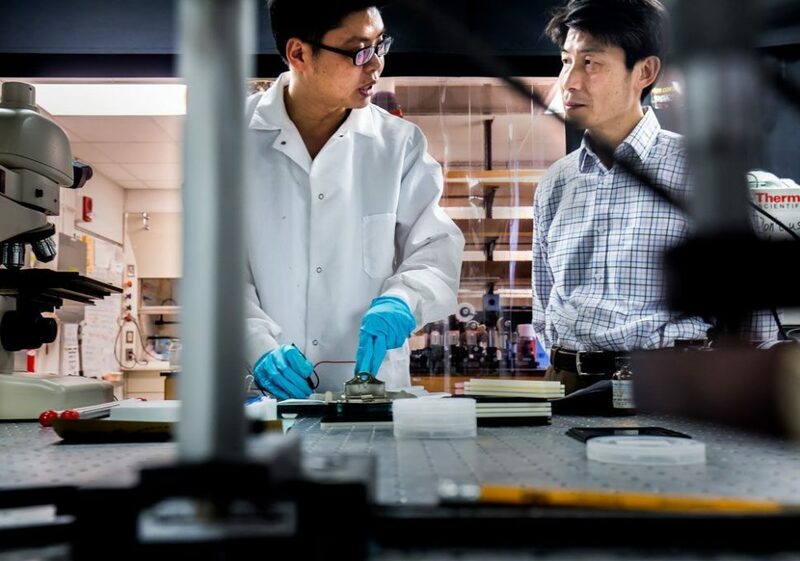 A team of scientists at the University of Michigan has developed a new technology that would eliminate the need for indium tin oxide for the production of flexible displays and touch screens. Supported by the National Science Foundation and the Beijing Institute of Collaborative Innovation, the study, “High-performance Doped Silver Films: Overcoming Fundamental Material Limits for Nanophotonic Applications,” is published in the journal Advanced Materials. By combining silver with a proper amount of aluminum (6%), UM scientists created a very thin silver film (7 nanometers thick) that is resistant to tarnishing and is nearly transparent (92.4% translucency). Also, researchers have found that the material guides light ten times faster, compared to other metal waveguides, which may make it useful for increasing computing performance. The University of Michigan has applied for a patent, seeking partners, in the hope of introducing this silver film to the market as a effective material in future touch screens and flexible displays. To overcome the shortfall in indium, the University of Sussex also turned to silver, but, unlike the University of Michigan, they used silver nanowire films to produce electrode structures. Silver is a precious metal, the extraction and use of which dates back to antiquity as one of the earliest metals known to humanity. The mining of silver ores began about five millennia ago. Throughout antiquity, silver was a valuable resource for several civilizations and had a cultural and societal significance. The discovery of the New World in 1492 was a turning point in the history of silver. The Spaniards exploited the considerable silver resources of Peru and Mexico. Silver was mined massively, followed by intensive production of silver coins. These coins were exported to Spain, then, once in Europe, they were recast before being minted again. After a long history of jewelry, silverware, and coinage, nowadays, silver has innumerable industrial uses, from electronics and medicine to solar panels. What Else Could Silver do? Silver can be used in a weather modification process called Cloud Seeding. In this process, silver iodine is dispersed among a cloud with serves as a cloud condensation agent and spurs precipitation from the cloud. But Cloud Seeding with silver is incredibly costly. Silver iodine for Cloud Seeding requires 100 m3 of water per hectare. Even if one molecule of silver iodine caused 1000 molecules of rain to fall, you’d still need about 1000 tons of silver to get the job done. That’s $1 million USD worth of silver you’d never see again. What else can silver do for us? When Will Trump Appoint a National Science Foundation Director?